Tall Timber | take your marks. go. I’m becoming a bit of a regular at the hospital. Between physiotherapy appointments and scans and general shoulder attention I feel like I’m always there. Another physio appointment, an early morning and the desire to brunch meant Lyds and I thought we’d check out Tall Timber, an unassuming café we always pass on the way to the hospital with the intention of ducking in. The first thing you notice when you walk in is how light the place seems. High ceilings, bare brick painted white and huge windows create a really airy space, making the café seem much larger than it is. The second thing I noticed was how genetically talented the boys making the coffee were. Beautiful men and coffee: my two favourite things. It’s clearly a popular spot. Obviously hipster, without being inaccessible to the masses, there’s a great atmosphere and it feels more like you’ve stepped into someone’s converted loft apartment than a too cool for school coffee hole. There were also a steady stream of paras and hospital staff frequenting Tall Timber – it’s close enough to the hospital to be a feasible trip, but far enough away that the coffee would have to be good for taste to outweigh convenience. Being off chocolate over lent means I’ve also had to give up my delicious mochas, trading them in for a long black. It means I probably get a better taste of the coffee, but it has left me longing for a mocha. The coffee itself was lovely: nice and rich, but not too bitter. Depending on the time – and the coffee – I normally enjoy my java unadulterated, but every now and then it’s a ‘two sugars kind of day’. 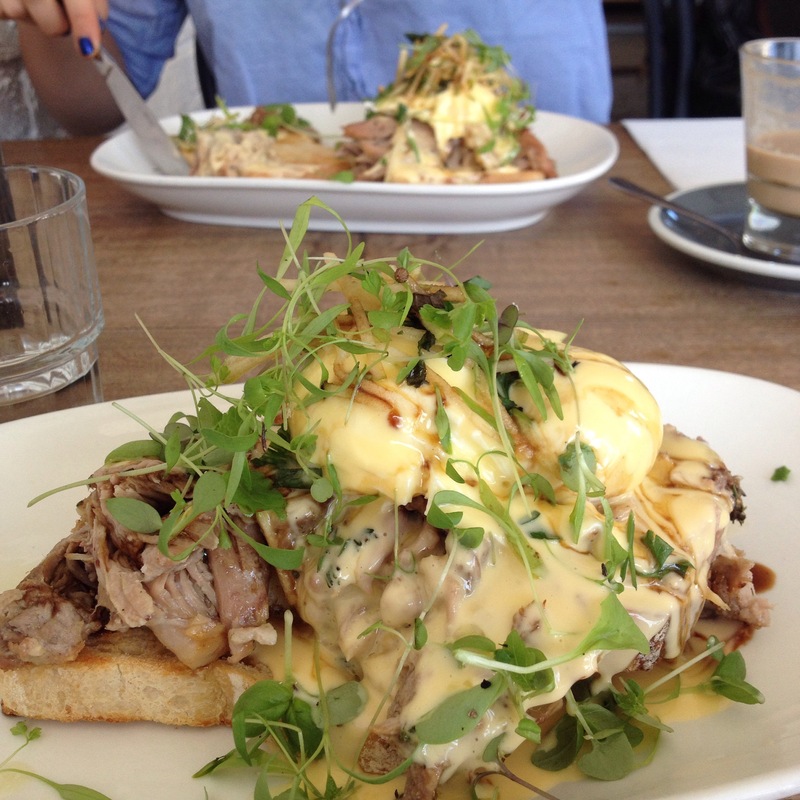 The Timber Benedict – absolute treat! 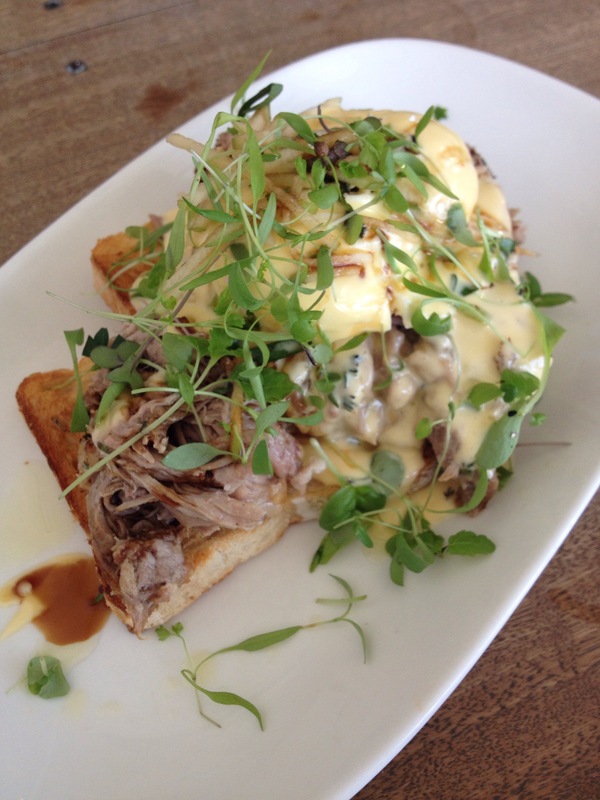 The ‘Timber Benedict’ is a wonderful twist on the classic Benedict. Pulled pork replaces the traditional ham, or bacon and the hollandaise is made with apple cyder vinegar making it sweet, almost candied. The pork came from the shoulder, and it just melted in your mouth, perfectly complimenting the sweetness of the hollandaise. The dish was garnished with mint, which contrasted flavours, sweet with fresh and shredded apple sprinkled on top was a wonderful surprise and a welcome addition in terms of taste. The sourdough was perfect to bring together all the flavours in this dish: everything really worked. The only thing that drove me mad throughout brunch was a subtle extra flavour in the hollandaise, an almost aniseed flavour. Lydia couldn’t taste it and I asked the staff if they put anything extra in the hollandaise, but she just looked slightly confused and confirmed it was just apple cyder vinegar. I remain convinced there was aniseed in there too. The only niggle I had was that the eggs were slightly over poached so didn’t ooze that wonderful runny yolk into the bread when you cut into them. The service at Tall Timber is fast, which is perhaps what keeps it such a firm favourite among those short on time. The specials are written on giant rolls of brown paper hung on the wall, everything seems very carefully placed to create the unique atmosphere. My only comment is that while the service was fast, it was a little cheerless: granted, no one really wants to be at work all the time, but it’s nice to feel you’re welcome when you go out to eat somewhere, even if all the staff secretly want you to go away so they can hide in the back.